Its nearly time for the launch of Superplastic! With all the guessing and Superplastic playing mind games over the past few months. A few hours ago Superplastic showed their cards (well, one hand out of the deck) with the reveal of JANKY! Like we said previously HERE. Back as we were all enjoying Christmas, we brought you news about a possible future collaboration between the minds of Paul Budnitz (founder of Kidrobot) and Huck Gee. Do you remember when we announced news about SuperPlastic? 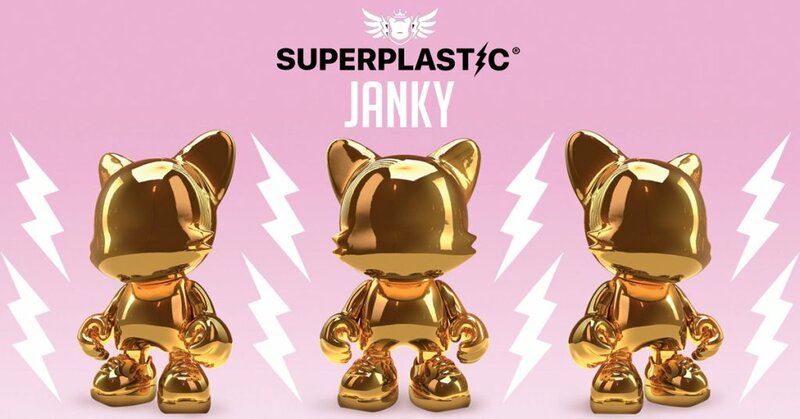 Well, it looks like they are about to launch their first BLINGING designer toy range with the character Janky. Talk about CHROME GOLD finish! You’ll need gloves to handle Janky. First impressions, totally Huck’s aesthetics and characteristics that we’ve seen over the past few years. This Janky edition as a first release? Let’s not jump to conclusions just yet, as we know how much of a trickster Huck is. You can almost guarantee different colours and editions. Well, guess we will find out on May 18, 2018. SUPERPLASTIC makes limited edition designer toys with the greatest artists in the world. Brought to you by artist & entrepeneur Paul Budnitz. Huck Gee is head of art and production. Head on over to superplastic.co now and sign up for more details. If you sign up now, you’ll be entered to win one of 100 signed & numbered launch editions of Janky Toys! 100 winners will be picked in May! Artists involved in this series includes: KEG CHUE, BIG BUN AUYUE, KALED, LOFT WEEPER, DR TEBE TELEJO, MONO ZI JUKU, PUZUL BANDIT, Q-RAY JETBEAD, DR LICORICE LAMA, MR ELK GINGHAM, MS BECS, VAL CARDIAC ROAR, PHEK, ZOLA GIRL, LOON G BOLDLY, COACH MAGDARLEN, CRAFTY O’DANISH and there are two secret artists included: ??? ?, ??? ??? ?????. Now you may not recognise those artist names, that wouldn’t be a surprise. Perhaps they’re all new artists, perhaps not…. Our favourite is Keg Chue! Let us know if you recognise any of the artists in the comments! Don’t forget to go sign up for more details HERE. The countdown on the Superplastic site runs down to Monday 14th May 2018! Cannot wait! We’ll keep you posted on future details of SuperPlastic and Janky Toys! Excited, yup! We are! Keep your eyes peeled for the TTC Mobile App for future details on this new adventure. In the meantime, go check out Superplastic on Facebook, Twitter & Instagram.